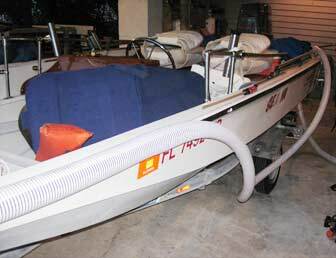 Years ago I spotted a 13 foot Boston Whaler that looked a bit odd, as if the rubrail were larger than normal. I wondered how that guy managed to get a heavier duty rub rail for his boat and went to check it out. He told me that he had slit a piece of 2" PVC suction hose and snapped it around the original Boston Whaler factory rubrail to protect and reinforce it. 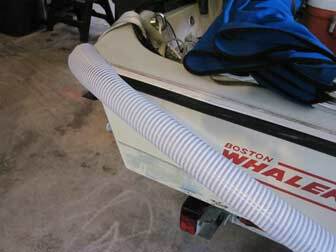 It looked like a great idea to me, so I immediately got a piece of hose and upgraded the rub rail on my 11' Boston Whaler. 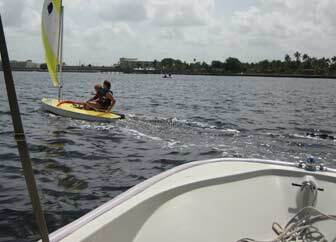 I later sold that boat and bought a 15' Boston Whaler and applied the same upgrade to that rub rail. After a few years in the sun, the PVC suction hose turns black and gooey to the touch, and the inside wall of the hose grows mildew that is impossible to reach and clean. It gets pretty disreputable looking and makes a mess of your hands if you touch it, and then it is time to visit Amazon Hose Company for a replacement. PVC suction hose is just clear plastic hose that has a spiral of PVC embedded inside it. It is used in applications where a flexible pipe is needed, but the pipe will be under suction and must not collapse. 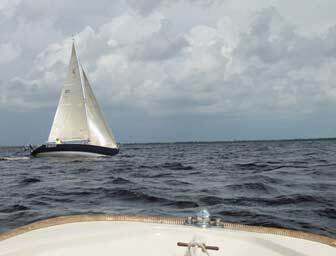 The PVC windings hold it open, and they also help absorb and distribute the force of any impact against the boat. The stiff PVC reinforcement in the suction hose becomes the backbone of the rubrail protector. The first step is to cut the hose to length. I cut a piece about 40 feet long for the 15' Whaler, planning to trim the excess off at the end. This kind of hose is easy to cut. I just slit the clear part with a razor knife until I could use tin snips to cut it the rest of the way around. The tin snips make short work of cutting the PVC winding at a nice, smooth angle. 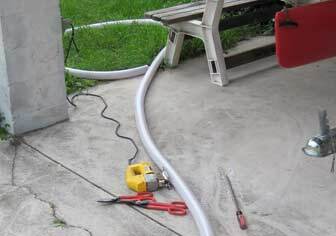 I used a jigsaw to slit the PVC suction hose lengthwise along a line drawn along the inside of the natural curve of the hose. It is important to make this cut as smooth and straight as possible, since any jagged edges tend to catch when forcing it over the rub rail. It is best to start with a new wood cutting blade, as this material will dull the blade rather quickly, making it harder to keep the cut straight and smooth. 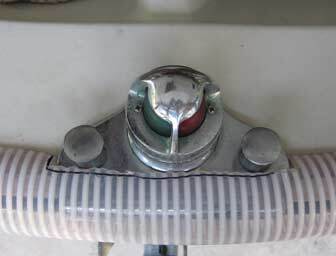 Start applying the rub rail protection hose at a stern corner of the boat by just spreading the slit open and forcing it over the rubrail extrusion on the top side and under the drip edge of the hull on the bottom side. It is best to leave a few inches hanging off the end, since the hose can creep forward a bit during the application process. You can always trim the extra neatly with tin snips when it is in place all the way around the boat. Be careful not to trap your fingers underneath the hose! It is a bit difficult to get it started, and I use a long screwdriver to pry the bottom edge of the hose around the lip of the hull. 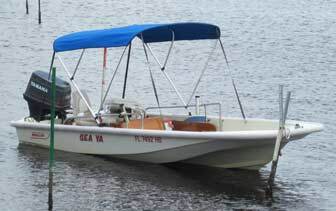 Our 15' Boston Whaler began its life as a Super Sport model, and came with the Boston Whaler combination bow light and chock assembly. It is necessary to cut a notch in the suction hose around the chock so that it will lay smooth. To determine the proper location of the notch, I just applied the rub rail protector right up to the bow chock, marked out the area to be cut with a Sharpie marker, then cut it out with tin snips and a razor knife. Once past the bow chock, just keep applying the rub rail reinforcement hose the rest of the way around the boat. At this point in the process, I was starting to feel pretty exhausted from the effort and took a break to catch my breath and take another picture. After giving my wrists a little break, the rest of the hose went on and I trimmed the ends just a little beyond each stern corner.